When my friend warned me about the number of bachelorettes in Nashville, I thought he was exaggerating. But when Saturday night came around, the streets were swarming with roving bands of identically dressed women. Gaggles of ladies in black or pinch tank tops with witty marriage-related sayings followed behind their queen bees, brides-to-be dressed in revealing white outfits, more often than not, with cowboy boots and a hat. They marched/stumbled through the streets like they owned the city. Inside, I had to elbow my way to the bar and my rather tall male friends were groped as they tried to wrap their heads around what was happening. It was all a tad surreal. After we dropped off our bags on the first night, we headed out for some libation to accompany our catching up. This self-titled “Bottle Shop and Tasting Room” features shelves of alcohol, a stand-up bar and a wall of beers to choose from. My beer-loving friends had no complaints as they picked from the wide variety. A non-beer lover myself, I was content with the cider in tap, though I warn you there is no wine. I hadn’t had dinner and for some reason the only place open nearby was a Little Ceasar’s. All seemed lost until I saw a golden savior in the corner – a dispenser full of goldfish! Self-serve and paid with a donation, goldfish in a cup was the perfect snack. We sat on the outside deck until it closed at 1am. My friend, a Ph.D. student at Vanderbilt, showed me around his campus and lab. Shaded by thick, vibrant green trees, it felt like a campus from the movies. His roommate calls it “dark”, but I’d just say there’s ample shade. Modern art statues pop up here and there. The lab… was a lab (as it should be). But we got to walk through a very cheery, decorated children’s hospital to get there. If you’re into quaint downtowns and gift shops, head to nearby Franklin, TN for a few hours. Check out more here: (http://downtownfranklintn.com/) We spent a few hours here at my friend’s recommendation after driving through (over? beside?) Natchez Trail. If you’re more hike-minded, wikipedia says this area encompasses a section of a 440 mi trail. We skipped the more crowded #1 Hot Chicken restaurant across the street for a 0 min wait time at The Row. My two friends were positive they wouldn’t have been able to tell the difference between the two hot chickens, though they don’t claim to be experts. The restaurant is split into two: the bar with live music and the separate restaurant with more tables and booths. We didn’t stay at the loud bar so that we could talk and catch-up, but I did like how high the ceiling was and the amount of windows. Basically, it was live music and a country bar, without a dark, claustrophobic feel. The main dining room is decorated with wall paper highlighting the musicians and songwriters who were discovered there over the years. My friends had hot chicken, but I took a light route with a delicious pecan salad and a pickled deviled eggs taster appetizer. Warning: the jalapeño margarita is TOO hot. Most major cities have a main drag… a street lined with restaurants, bars and clubs that serves as a hub for debauchery into the late hours. Broadway is that street for Nashville. The fun local twist is the abundance of live music, and if you get there in time, a good number of leather boot stores. And no need to fear, the souvenir shops stay open late. We bounced around the street getting the general feel before settling on The Stage. The live music pours out onto the street, so you’ll know what you’re getting before you walk in. The dance floor is large, and there’s second floor balcony in case you want to chill and watch the dancers below. The long bar, and additional small bar across the room, help the crowd get their drinks fairly quickly. It has a strong southern flavor, with a few couples dancing in the center, but mostly caters to a young, party crowd. We had a good time besides the predatory bachelorette party girls. BRUNCH!!!! Clean, bright, and popular at around 11:30am on Sunday. All the other places we called had a 30 minute wait, but I don’t think we could have asked for more. A diverse menu of interesting options at reasonable prices kept me happy. I had a Florentine Eggs Benedict… nothing unique… but the Grits of the Day was chorizo and green pepper – mind-melting good! Oh boy. To those outside the country music universe, you may not fully understand what this is… The Grand Ole Opry started as a radio show in 1925 and has grown into country’s most famous stage, featuring classic artists and today’s hottest chart toppers. The Gaylord Opryland Resort is a massive, nearby hotel/botanical garden/amusement park/convention center hybrid. Essentially, it is a hotel with its inner walls connected, and the massive courtyards they create are covered like a greenhouse. The courtyards include “outdoor” restaurants, tropical plants, winding pathways, a mini-town center, and even a short waterway with a boat ride. It feels a bit like you’re walking through a Southern-themed Disney World. However, with the only ride – the slow-moving boat – being priced between $7-12, don’t think that there is much to do besides observe your surroundings and maybe grab a drink. Not too far from the airport, this may be a fun place to kill sometime on your way home. **Pro-tip – skip the $23 parking by using the mall parking lot next door. There is a gap in the wall between the mall and the hotel. Overall, Nashville is a nice stop, but would probably be even more satisfying with someone who lives there or has an inside scoop on what to do when. 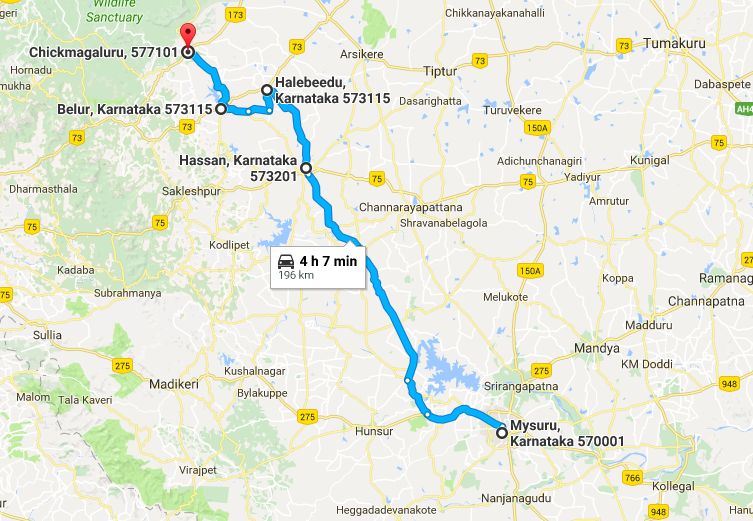 From BANGLAORE to MYSORE to HASSAN to CHIKMAGLUR and back. Some may point to the food or the clothing as the most obvious signs of difference between the North and the South, but for me it was encapsulated in the sights along our drives from destination to destination. While the north can be brown and dry, the south is green and lush. While the north lets color pop in their saris, turbans and trucks, the south lets the color spill onto their homes and businesses. From the road you can see the region’s lifeline – its agriculture – paddies of rice, feilds of sugarcane, and forests of coffee and tea. Here’s just a glimpse at the sight from our short trip in the south. 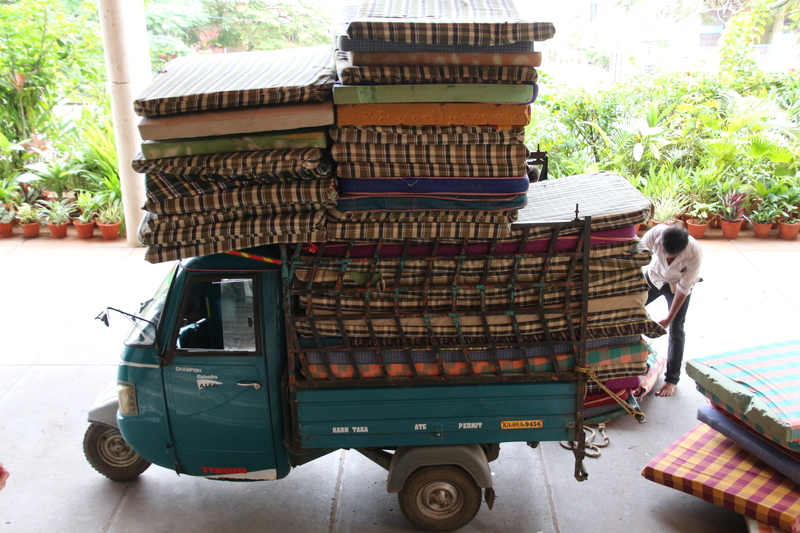 As you can see, there’s one thing that does stay consistent between north and south… Indians try to fit ALOT on their bikes. 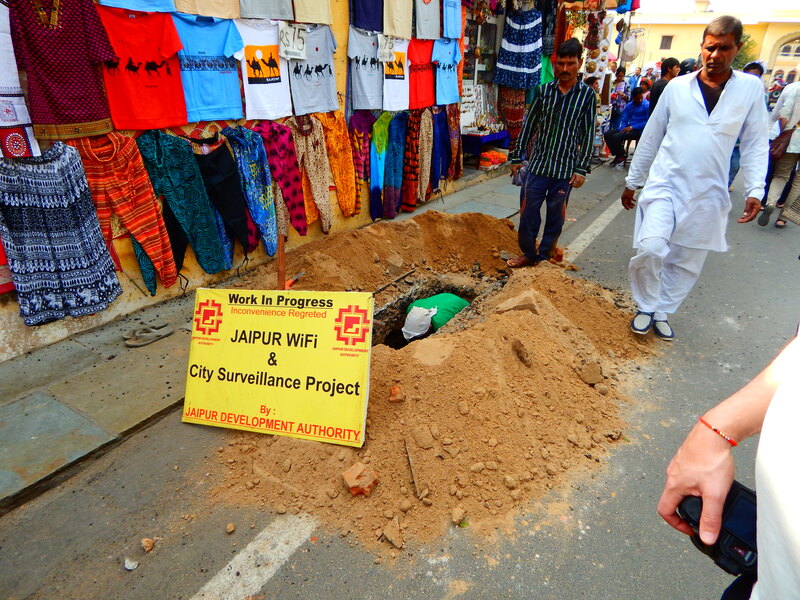 Oh, Jaipur. The Pink City. 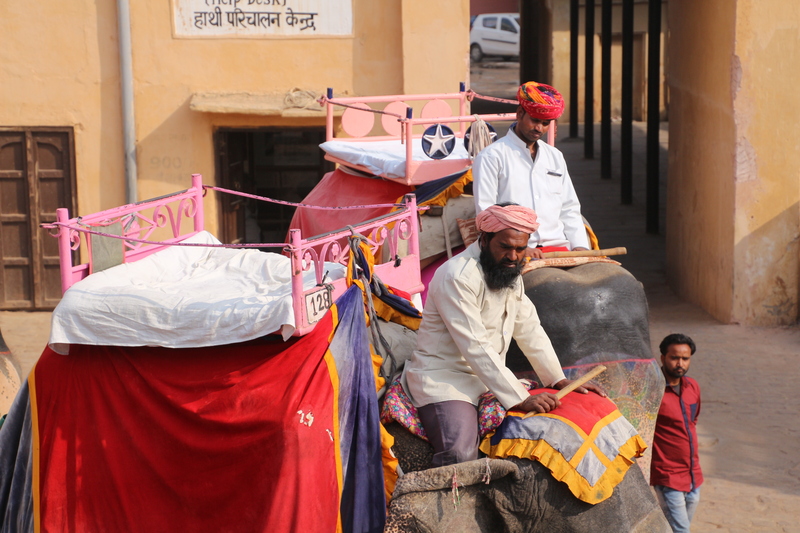 Jaipur holds a special place close to my heart (Coincidence, it’s called the Pink City?). I’ve been to India three times. Each time I’ve gone to Jaipur, and each time I’ve appreciated it more. First, this is the city closest to Udayan, the home for street children where I spent 5 weeks in 2006. I flew to India by myself as a 19 year old girl to experience a different culture and help other people. But let’s be blunt — While I taught English, Drama and Painting, it was really I who learned a life’s worth of lessons. I gave them the love that I could, and I hope it helped. But the perspective and resilience I witnessed on the trip changed me for life. I plead to whoever wants to volunteer in another country – stay for a significant amount of time for a greater chance at making an impact, as well as experiencing more immersion. 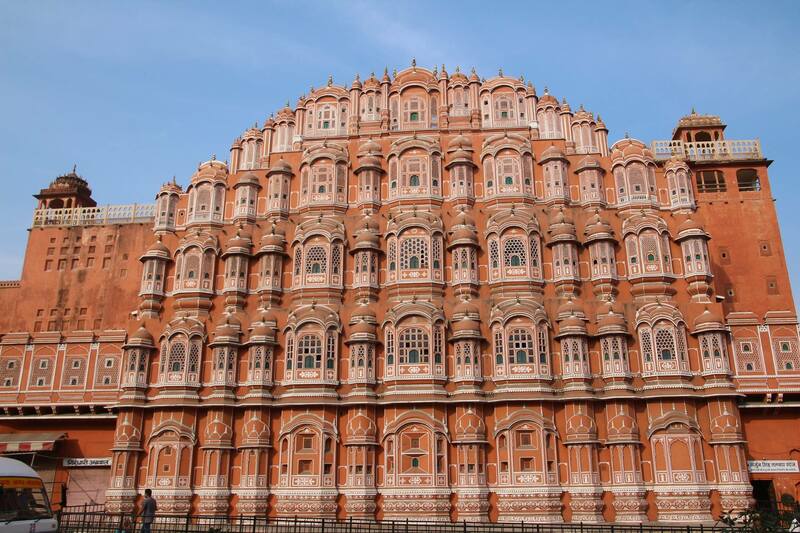 Founded in 1727, Jaipur is the capital of the state of Rajasthan. It is called the Pink City, because the entire city was painted pink, the color of hospitality, for a visit by the Prince of Wales and Queen Victoria in the 1800’s. The population has maintained the practice ever since, which may be one of the contributing factors to making the city one of the most visited by foreign tourists. 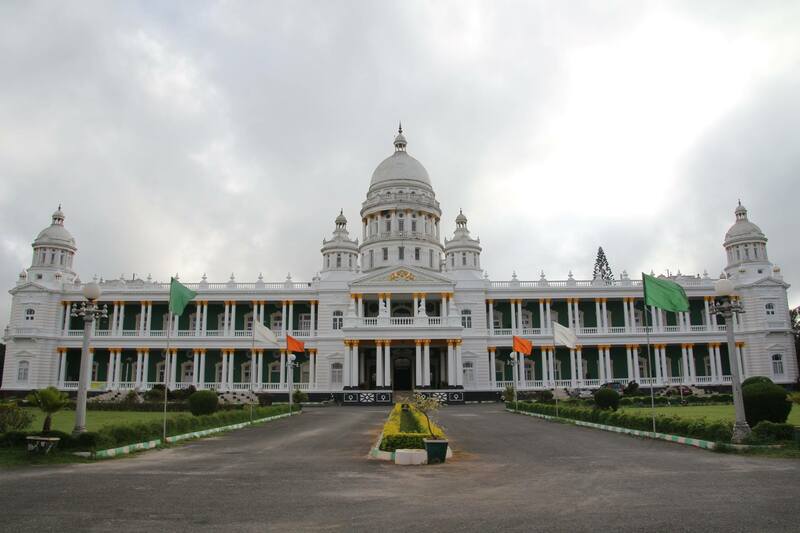 In some ways it has resisted modernization and therefore is a bit more charming than New Delhi. But with close to 7 million people, it’s still on the crowded side. On Day 4 we arrived in the evening. One of our goals on the trip was to get some clothes tailored. This was under the guise of having Indian clothes to wear at future events, but let’s be honest – they’d essentially be souvenirs. And why not! 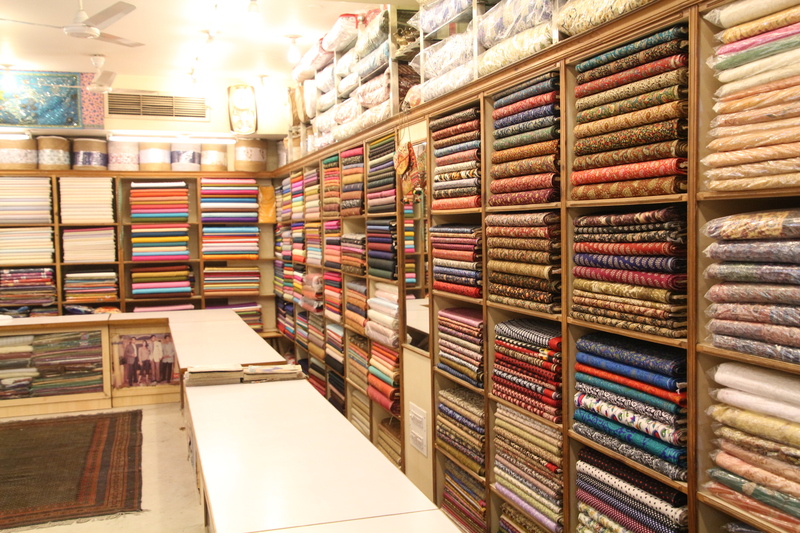 I highly recommend you engage a tailor for a salwar or even a man’s button up shirt. Just make sure they have enough time to make it and deliver it to your hotel (24 hours preferred). If you want a sari, I suggest using the time for this, because unless you want a stretchy, one-size-fits-all blouse, you’ll need it sewn (blouse material is included in price of sari). Warning: They will take every bolt of cloth off the shelves to lay out in front of you. You will feel awkward and guilty as you know someone will have to fold it all again. But there’s little you can do. It’s how they like to do it. Just be clear with what you want. And try not to get frustrated when you say “blue” and they show you red, green, and black. It’s not a language barrier thing, it’s their theory that they’ll magically inspire you to want all of them. Having eaten Indian food for several days, that night we took a break with an Italian restaurant. To our confusion, despite looking like an Olive Garden type chain, they were out of half the things on the menu. I’ll never take endless pasta for granted again! 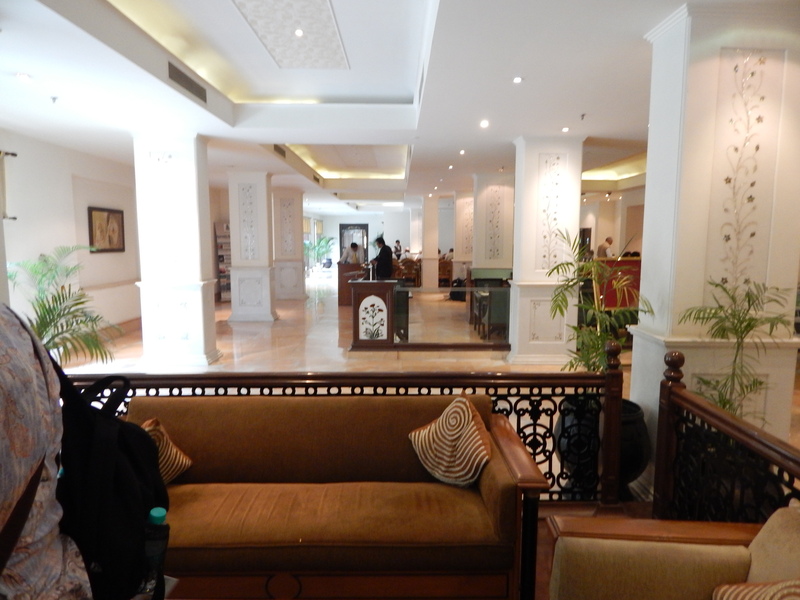 A large step up from the Hotel Mansingh in Agra, this hotel was clean and spacious with greater sense of grandeur. The quality of breakfast was measurably better and included a manned egg station. An encapsulation of Jaipur’s history, this amber sandstone and marble fort is built above its water source, the Maota Lake. More palace than fort, this site had a huge impact on me on my first trip. It was unfortunate that I missed it, but at least my family got to go. 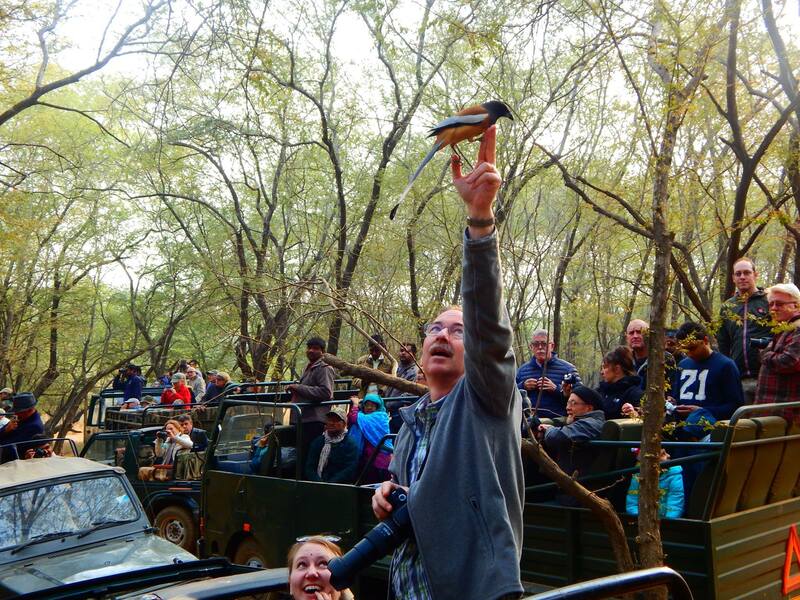 As many guide books will mention, you can choose an elephant ride or jeep ride up the long stone path to the gates. Inside, the opulent rooms will bring palace life alive in your imagination. Like most forts, it also has a public and private audience hall, plus a mirrored room. A personal favorite is the peacock mosaic artwork. Watch out for the number of hawkers that will be there since it’s such a hot tourist spot. You may need a guide to appreciate all of the history, but make sure you can understand them before you hire them! Also, some say this could take a day. I think 2-3 hour works. I’ll talk about it because I should. But I’ll be honest, I’m not a science/math girl, so I’ve never been particularly intrigued despite how advanced this yard full of astronomical instruments was at the time it was built. Plus, I was so miserable from the heat and my stomach issue, that I could only stand for 5 minutes before my poor husband took me back to the air conditioning in the waiting tour van. This Rajput-built UNESCO World Heritage site is the home of the world’s largest sun dial. The stone monuments allow the viewer to see astronomical movements with the naked eye. It’s impressive… don’t listen to me…you should go see it. This is another impressive, famous site; but when you’re starving, and you’ve already seen a gorgeous, massive palace/fort that morning, it’s not a sin to pass up. Since the majority of the palace is still a royal residence, you may only walk around a museum set up within several of the rooms. You should do it if you trip to India is short. Why not? It’s literally across the street from Jantar Mantar. But with 5 more cities to go, we were hungry and we were feeling cheap – so we passed this time around. 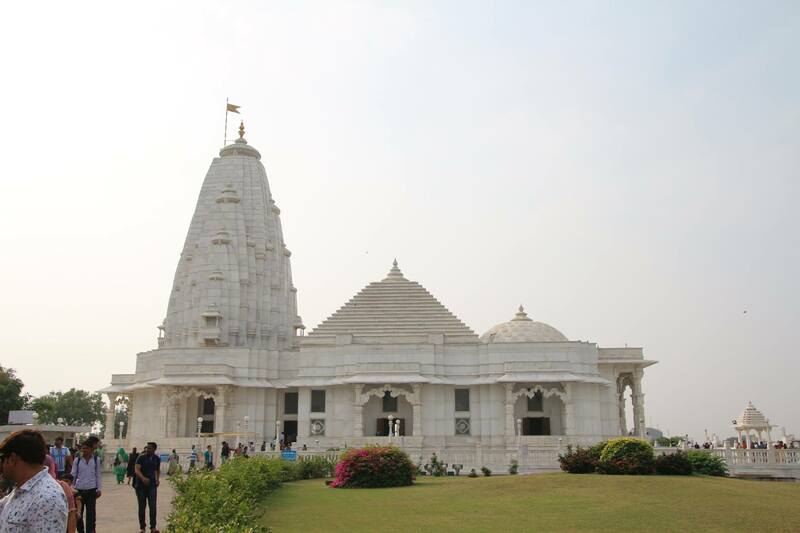 Birla = The wealthy family who has been building temples throughout India for the past 80 years. We hit up this temple on our way out of town. 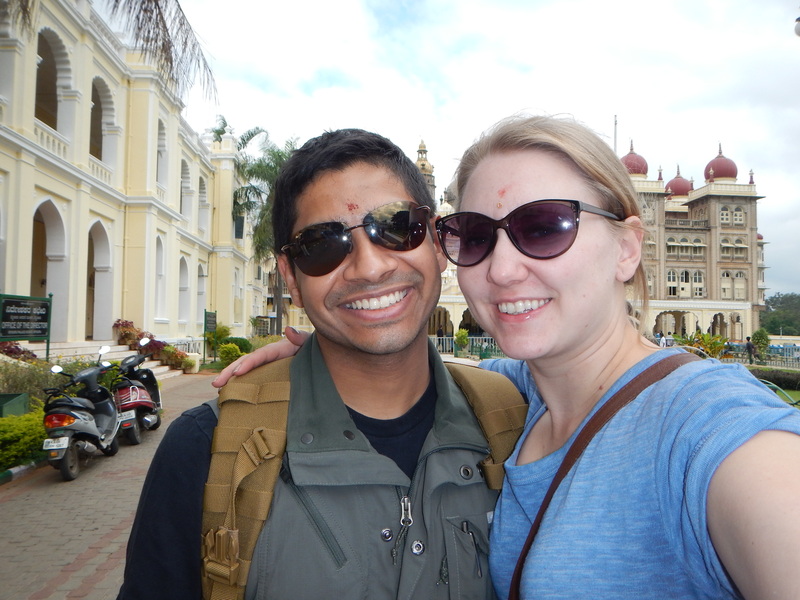 We had hoped to visit Pushkar that day, but the guide alerted us to the fact that it was a religious holiday, and therefore would be so crowded that it would ruin the entire experience (the city is a main pilgrimage site). 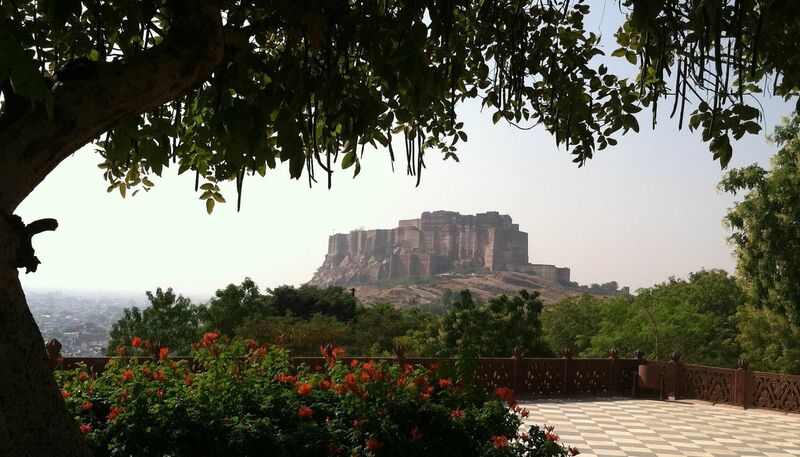 Instead, we decided to spend some time here and arrive in Jodhpur a bit early. This gleaming white temple is modern and active. 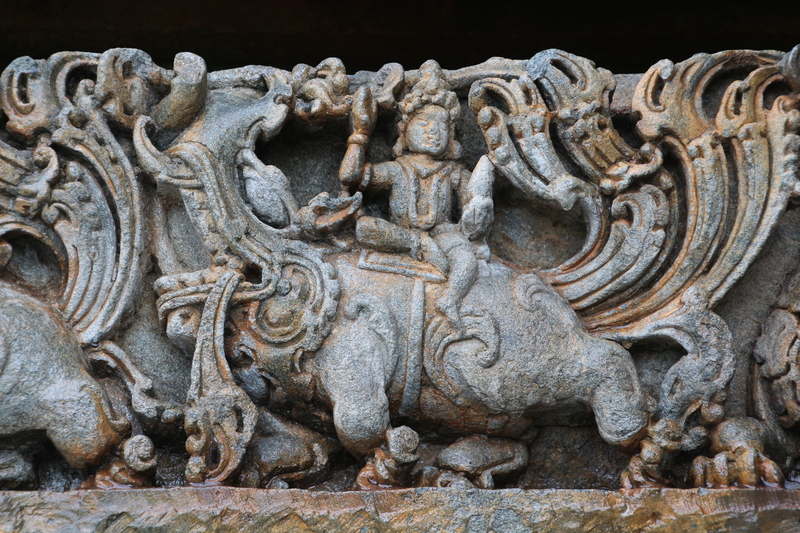 In Hindu fashion, you will see carvings of the world’s great religious teachers and figure, not just Hinduism’s. You’ll leave your shoes with an attendant and walk on the cold white marble in your bare feet. If you want to donate a bit, you can walk around the idol clockwise. 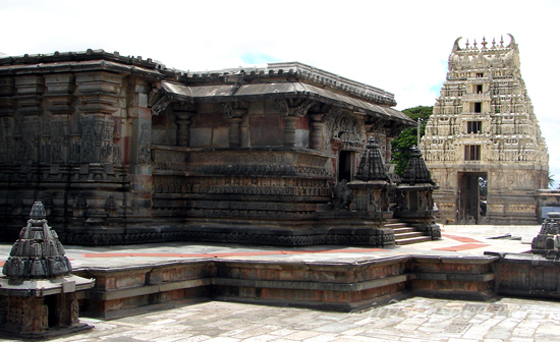 The carvings on the wall depict popular Hindu stories. A moment that sticks out from this stop was when some young Indian men told my husband to take a hike so they could have a photos with us all. At this point, we were used to the celebrity status, but I had decided that if they want a photo of me, my husband was going to be in it too. Since we’d be in the van for hours, I suggested we check out the local temple nearby dedicated to a different deity. 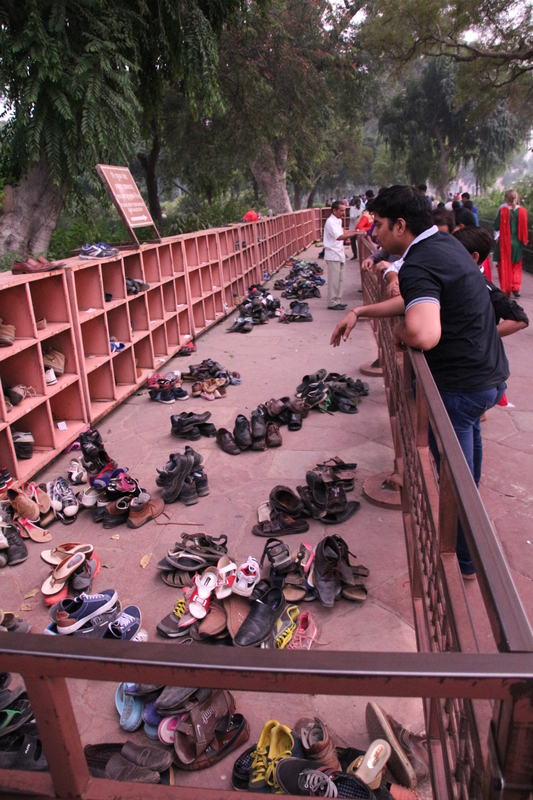 Locals take off their shoes walk in through one of the lines, receive a blessing and leave. Some buy sweets to have offered in the temple. 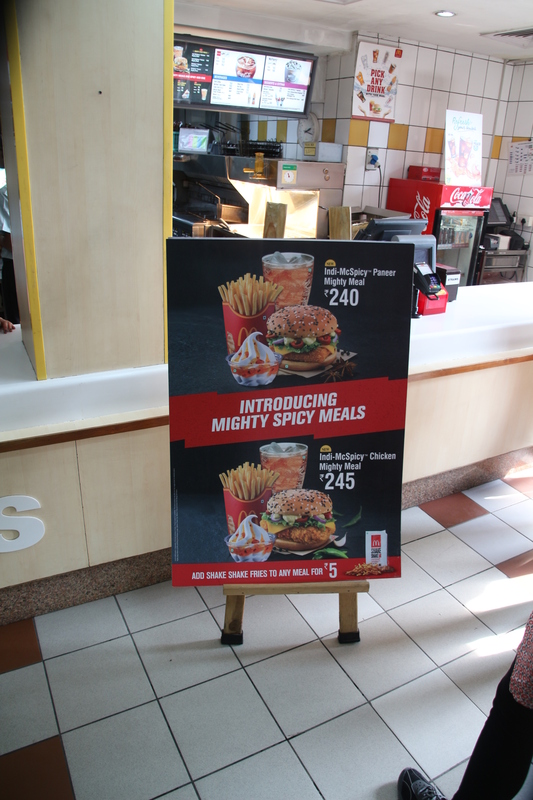 Seeking another break from the norm and a fun exercise in globalisation, we ate at McDonald’s. With Hinduism’s worship of cows prevalent in the culture, there is no beef burger served. Beef is so rare in India, that I suggest never eating it because you don’t know where it came from or how long it’s been there. I had some bland Mcnuggets for my stomach, but the McSpicy Paneer was a big hit in my group. If you look around, you’ll see that McDonald’s is a regular restaurant for middle class families without the negative connotations that Americans put on fast food these days. A short anecdote. My dad needed a camera battery. If you know my dad, a camera on a trip is not just an accessory, it’s an extension of his arm. We tried to think of all sorts of things to solve the problem, including using Amazon to ship something in country to a future destination. 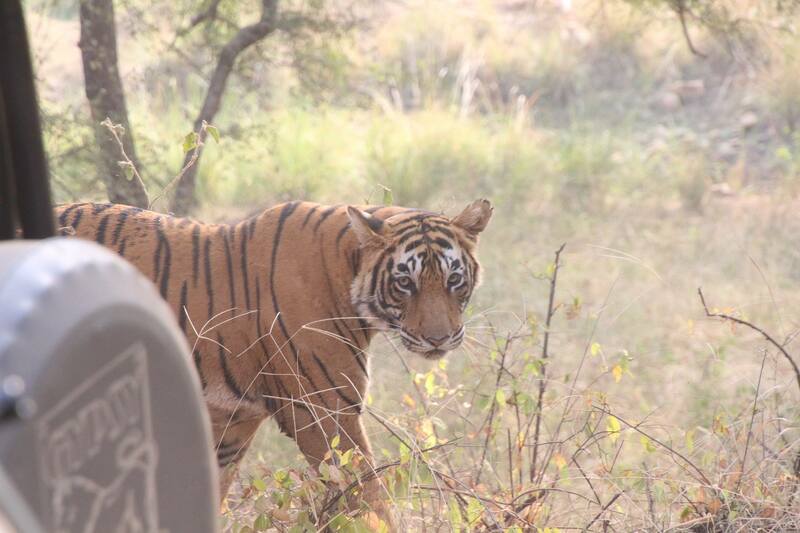 But the answer was right in front of us – our guide, Sanjay. Between sightseeing and shopping stops, he pulls the 9 passenger van into what some might call an alley. To the left and right were closet-sized shops overflowing with gadgets and tech-type things. Apparently, this was the neighborhood to get all things camera. Sanjay, my dad and the guys left the van to look. Unfortunately, I don’t remember the details, but in entailed every shop owner swearing they had the battery. One finally produced the goods. In the meantime, the ladies are in the van watching the scenery. The driver stood guard by our van. Across the street there was a woman selling oil from a vat. Behind a colorful door was a mother and her children. She would occasionally come out to wash dishes in a bowl of water, spilling the dirty water onto the street. Monkeys darted in and out of the scene as easily and unremarkably as would cats. We bolted from our seats when we saw an elephant lumbering down the extremely narrow street. He just meanders past us. All of us just laughed at the absurdity if it all. 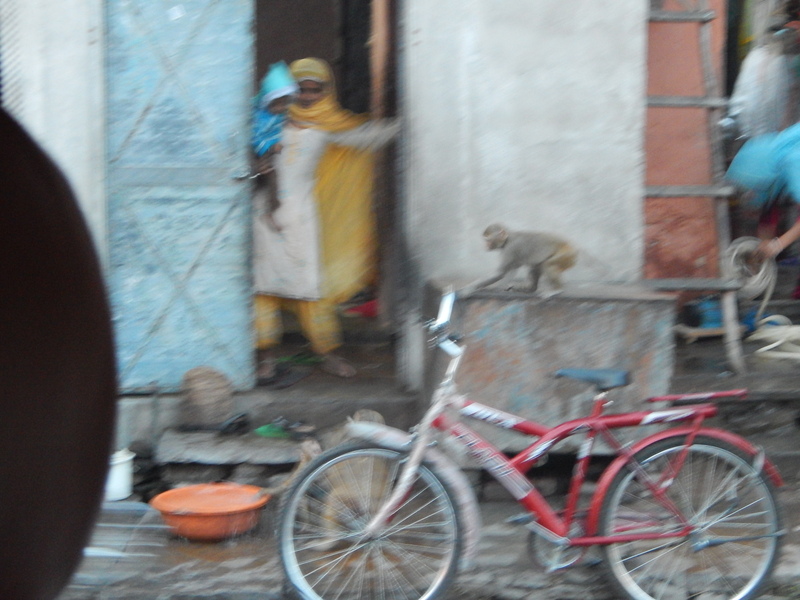 My dad was haggling in camera alley as monkey and elephants meandered by. Welcome to India. 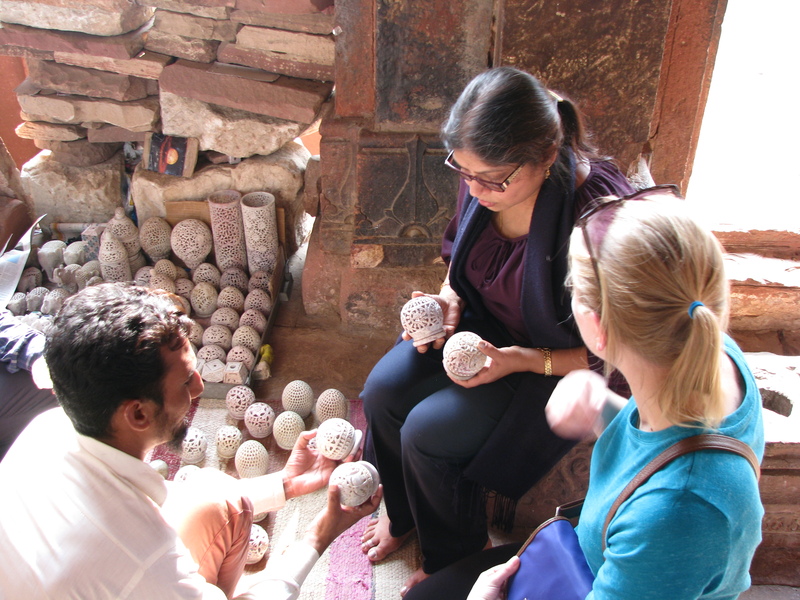 If you are on a tour, you will be brought to a jewelry store to be “taught” about Jaipur’s famous industry. The lesson consists of showing how semi-precious stones are ground down and polish. Then the real fun begins in their showroom… As long as you know going in that you’ll be plied with drinks and salesmen will follow you around, it won’t be so horrible. We found the prices to be fairly comparable to the U.S., but if you’re looking for something with significance, at least you can tell people where you got it. I’ll wrap it up with restating my undying love for Jaipur, and these amusing photos of a whole family on one motorcycle and a turban shop. Want to buy a turban? Agra is the home of the Taj Mahal. For most people, that’s all they need to know for them to visit. But don’t be fooled; there’s much more… both good and bad. So while I’ll talk about the stunning World Heritage sites Taj Mahal, Agra Fort and the lesser known Fatehpur Sikri; I do have some controversial thoughts that will help you prepare and take advantage. 850,000 people. The poverty that visitors see when driving into the city may be very… eye-opening, but it’s as much a part of India (right now, hopefully not forever) as Taj’s grandeur. 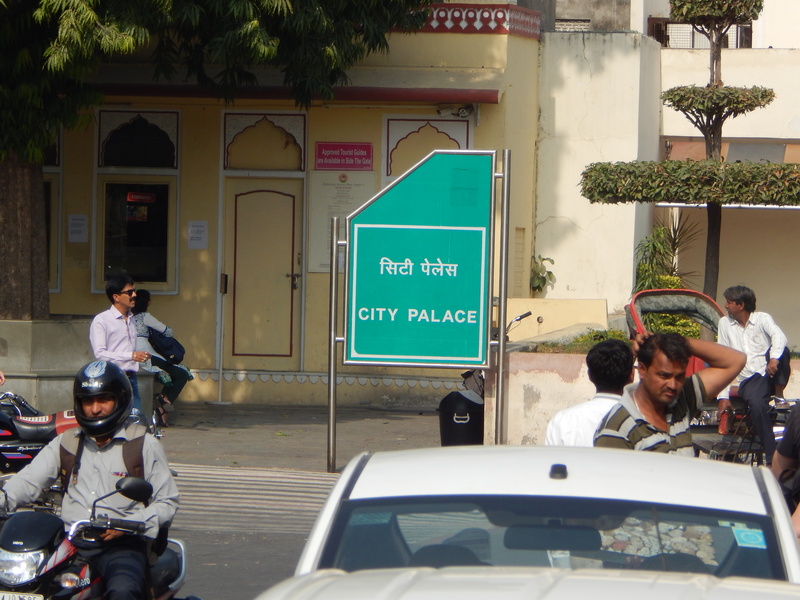 Everyone just needs to remember that each Indian city is as unique as New York or Minneapolis or San Diego. 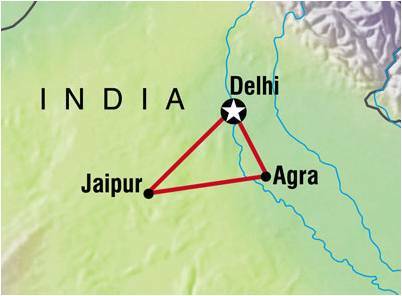 It’s why I suggest seeing Jaipur, Udaipur or Jodhpur in addition to Agra and New Delhi – to see the calmer/cleaner side of Northern India. Now that you’ve had a warning, it’s time to get you excited. 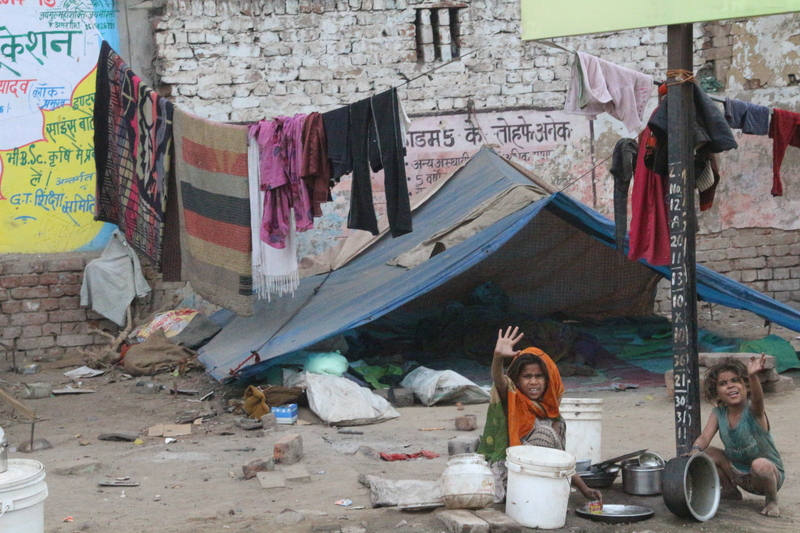 Welcome to the epitome of India’s juxtapositions, Agra’s poverty against one of the Seven Wonders of the World. 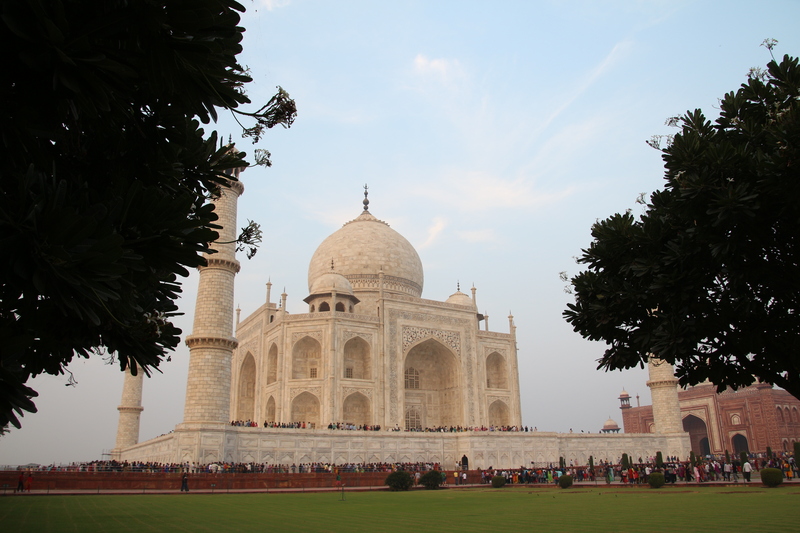 The Taj Mahal, a tomb built by an Emperor’s love, is breathtaking and perfect. The precision of its construction makes you think you’re looking at a postcard. When you take off your shoes (which you’re required to do), and put your bare feet on marble, the pristine picture becomes all too real. Let me rewind. You will need to buy a Foreigner ticket for 750 rupees (in 2015). Indians pay 20 rupees. But as you’ll see, the Foreigner ticket helps you cut an epic line. (Indians willing to pay the 750 can also cut the line). The ticket includes a bottle of water and “footies” – fabric booties that you need to cover your shoes to step on the gorgeous white marble. Make sure you step into the correct line when walking through the ticket line – there is one for men and one for women. They’re tight and uncomfortable, but push through and it will open up into a courtyard. The gateway itself is impressive, but as you look through the archway to the Taj, it will be a moment you’ll never forget. When you’re up there, don’t forget to look across the river to where the Mughal King had planned on building an identical tomb in black for himself… too bad his own son imprisoned him and took his “throne.” Take your time and enjoy the views! Note: this site won’t take up the whole day. While this fort is impressive from the outside (my family loved the Indiana Jones-style rolling stone defense gate), my interest was captured by the complex family palace. Akbar the Great was known for his relatively peaceful reign of religious tolerance in which Hindus, Christians, Muslims and more all got along. I’m not sure which came first – if his rule was a result of, or inspired by, his marriages, but Akbar married three women – one Hindu, one Muslim and one Christian (from the Portuguese influenced Southern India). Of course, he had an impressive harem as well, but it was expected at the time and often had political significance. His palace reflects these separate spaces for each of his wives. 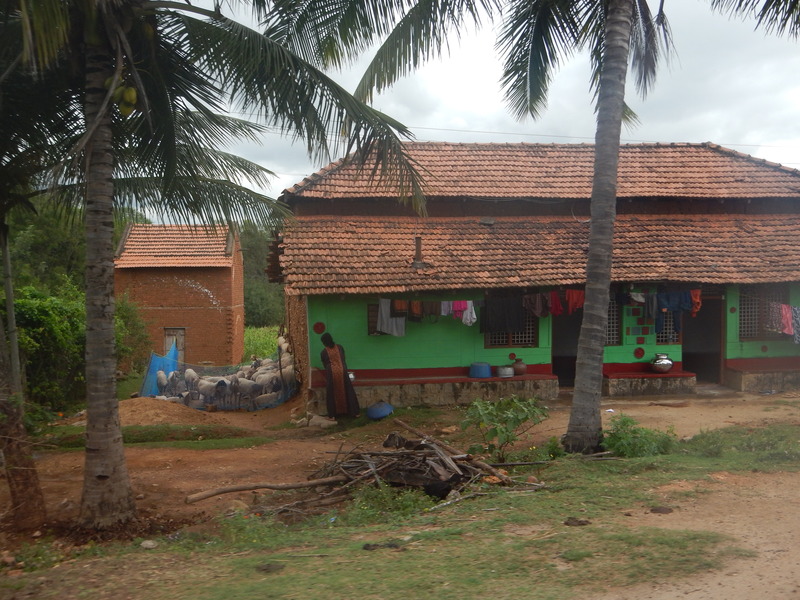 The kitchen was for the Hindu wife who enjoyed cooking and could only eat vegetarian. The white marble bedrooms belonged to Shah Jahan’s daughters. When his son imprisoned him, it was in this fort that one of his daughters cared for him until his death. He was held there so that he could look out at the Taj Mahal, his wife’s tomb. The green courtyard was once used as a bazaar staffed only by women, so that his wives and concubines could shop without being seen by men. This may look like another fort, but it’s more accurate to think of it as a city. 2mi x 1mi, it is surrounded by 5 miles of fortified wall. Inside you will find several different segments to visit: a palace, a mosque and the tomb of a Sufi saint. We came up through the “back door” to avoid the crowds and peddlers. We saw where the crumbled walls showed the stalls that were used by the locals to sell their wares when the city was the empire’s capital. The walk was markedly peaceful. The multiple buildings within palace were incredibly intriguing to me. You had the public and private viewing hall. You had Emperor Akbar’s winter and summer bedrooms. 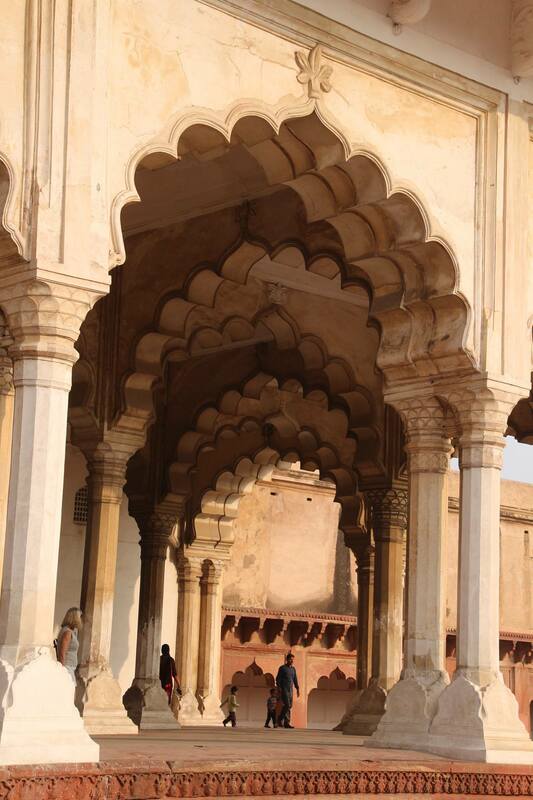 Plus, there’s an ornately carved mini-palace for each of Akbar’s brides. If you look closely, you can see that each is carved in the style of the bride’s culture/religion – Hindu/Gujarati, Muslim and Christian. You’ll see a platform in the center of a pool, used for singing competitions. Next time someone makes fun of American Idol – you can let them know it’s merely following a human tradition historically enjoyed by Emporers. That’s just part one. 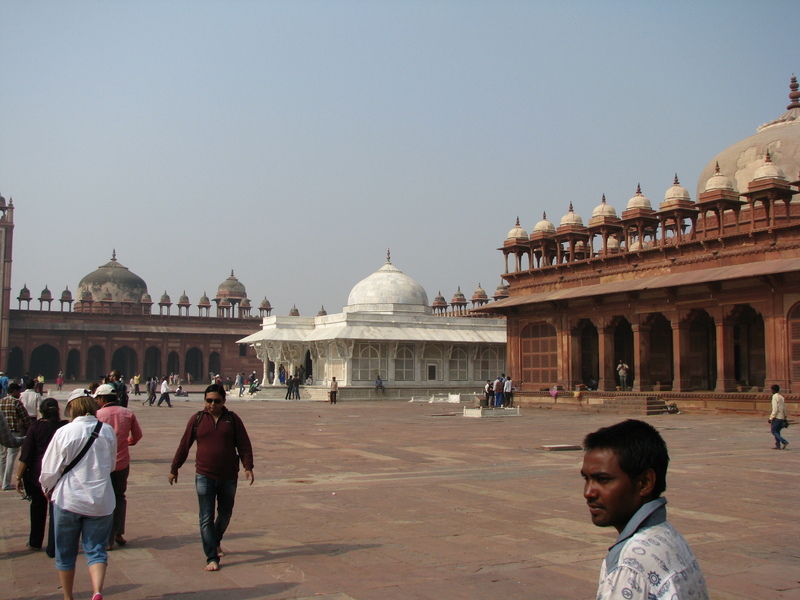 The second is a pilgrimage site made up of a mosque and Sufi tomb. You must leave your shoes outside. I can’t guarantee it, but your shoes will probably be there when you get out – ours were. The Tomb is in a white structure in the center of a large stone courtyard. You can take a look and take pictures from the outside; but if you want to participate, it will cost you. It costs about 750 rupees/$12 per person or couple to enter. You’re given a plastic hat to cover your head. You walk around the “casket” in a dark room. You lay out a fabric you were given on top as an offering. Then you tie a red threat with three knots on a carved metal grate, making a wish. As you leave, you’re hit on the head with some peacock feathers. Voila, you’re blessed. The price seems a tad steep, but you will be participating in a ritual that thousands of local Indians do. This stop broke up a long day of travel to Ranthambore. This is a tale of how we were conned… and how everything turned out OK anyway. 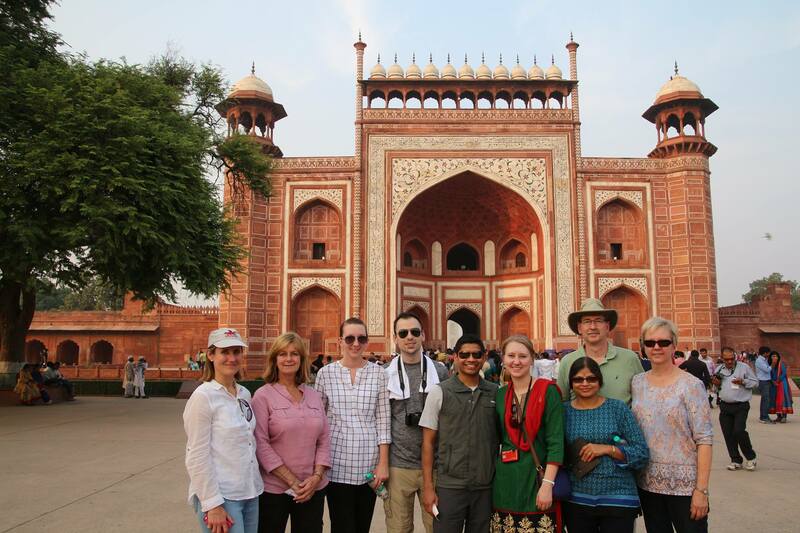 Thomas Cook had arranged a local guide to show us through Fatehpur Sikri. He was knowledgable and knew a back entrance that kept us away from the relentless peddlers at the main gate. He walked us through the process at the tomb. All was good, until he told us we should meet his brother… his “brother” was hunkered down in a corner behind a wall with some of his friends. 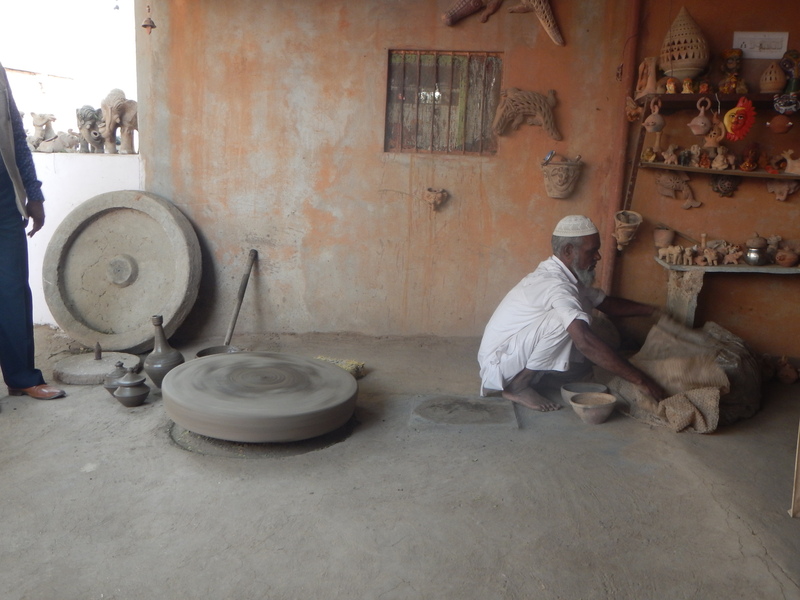 The guide explained that the carved stones were his family’s trade. I’m sure it won’t surprise you that I now have 0% faith that those men were relatives at all. A few of our members stepped back to watch, but my parents and I couldn’t turn away from the figurines – it was our first time to really shop. The prices seemed astronomical until my Mother-in-Law stepped in. Soon it was my MIL making package deals. We were generally satisfied as we walked away. After a short bus ride to the parking lot where we’d meet our van, we were led to a group of buildings. The local guide politely asked my MIL in Hindi if we would mind stopping by the government store. His tour guide company required him to bring the groups here. That’s when it clicked… the stop by his “brother’s” business was off-script. It took about 30 seconds in the government shop, where the prices are fixed, for my MIL to see that a few of the items we purchased were overpriced even after negotiating. I bought two magnets before we were hustled out the door by a furious MIL. We all shuffled back to the van without her. After about 5 minutes, my MIL stormed back on the bus with a very contrite looking guide. We dropped him at the exit and were on our way. That’s when my MIL explained: The guide begged her to not tell his supervisors. But my MIL wasn’t hearing it. She hated the idea that she had paid more than she needed to. It wasn’t the game that he was playing that irked her, it was the fact that she paid more for the figurines than she could have gotten at the store. We don’t know what she said exactly, but she got him to turn over 2000 rupees to pay her back for the difference. Don’t mess with my MIL! I’m usually very easy going when it comes to hotels. I don’t want to be a princess about anything, especially since we were staying in hotels as opposed to hostels. However, I found that the service here rubbed me the wrong way. The hotel restaurant had an extremely odd menu that attempted to cater to international tastes and had poor selection Indian food. A large amount of the international food involved raw vegetables, which you’d think they would know most visitors have been advised not to eat. We really wanted some samosas – just a snack to hold us over, but the menu only said they were available as a “Late Night Bite”. After much negotiating, we got some snacks out, but nothing to write home about. Breakfast was lackluster as well – just soggy, sorry excuses for continental cuisine. Overall, the manager’s attitude was unwelcoming. The only interesting twist to the hotel was the backyard pool with peacock topiary. There is no way I’d even dip a toe in the dirty water, but at lease it was fun to take picture on the stepping stones. Clean and modern. A perfect choice for an international traveler who isn’t looking to “rough it.” The breakfast buffet was mediocre by my measure, but did include international food. For my family’s first trip, I think it was a good transition for them. The formal doorman is always a nice touch. My favorite part of this World Heritage Site is imagining what it must have been like day-to-day. The fort includes the public audience hall where the local farmer brought his grievances to the emperor. The wives and concubines would watch the proceedings through grills carved into the the marble and sandstone because they weren’t allowed to be seen by the general public. There is an entire carved building just for dancers to perform for the royal family. There are the Emperor and his wives private quarters, including what must have been a very luxurious bathroom. Just take a moment to let the other visitors disappear and see the fort in its heyday. These pictures don’t do the sprawling fort justice. If you’re a fan of WWI history, there is also a military museum dedicated to the period in the entrance archway that once housed the musicians that played the emperors entrance music. Look a tad familiar? Humayun’s tomb is the predecessor to the Taj Mahal. 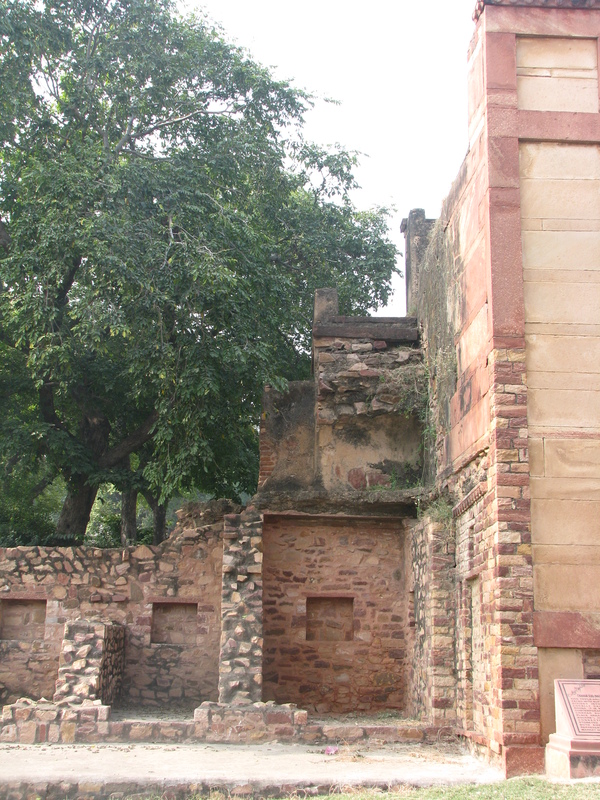 Humayun, the second Mughal Emperor earned his place in Delhi. After his army was driven out to India to Persia, he made his triumphant return in 1555, only to die falling down a flight of stairs shortly after. It definitely leaves an stunning first impression. There is a steep set of stairs to enter the tomb. It is not handicap accessible. Have you ever wanted to live at Downton Abbey? Have you ever wanted to live in Downton Abbey and then take a trip to India? The Imperial Hotel makes you feel like you’re walking into a novel or Masterpiece’s Indian Summers. We had the impeccably presented lunch buffet. If you ask the concierge, you may get a tour of the other restaurants and bars in the hotel – each have their own story and history. If you’re too tired to enjoy it… take a nap! After a quick walk through of the small museum earlier in the day, we came back for the light show (after dark, about $30-40 pp). About 80 folding chairs are set up facing one of the only crumbling, yet standing walls left of the Old Fort. 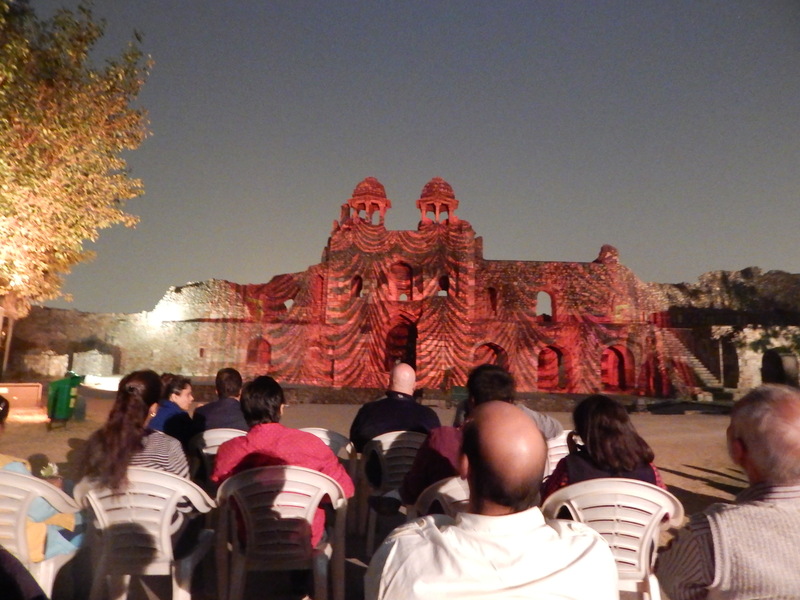 For about 30 minutes brilliant colors and loud music guides through the history of the six Mughal emperors that ruled Delhi. If I was quizzed, I’d say I remember Babur, Human, Akbar and Sha-Jahan…4 out of 6 ain’t bad! I’d say the content was a bit dense and the program overall a bit long, but it was certainly a unique experience. However, if you’re a history buff and can’t make it, you will hear their stories many times in your travels across the North. The Mughal emperors’ lives rival soap operas, with wars, romance, family betrayal and more. For example, the emperor who built the Taj Mahal was arrested and locked away before he could build the black mausoleum that would have mirrored the Taj and been his own resting place. Or there’s Akbar who had one Hindu wife, one Muslim wife, one Christian wife, and 50 concubines. While there may have been drama in his personal life, his open and accepting love life reflected his political beliefs, and the region enjoyed tolerance, peace and prosperity. The red curtain is still “closed” before the show. I saved the best for last! 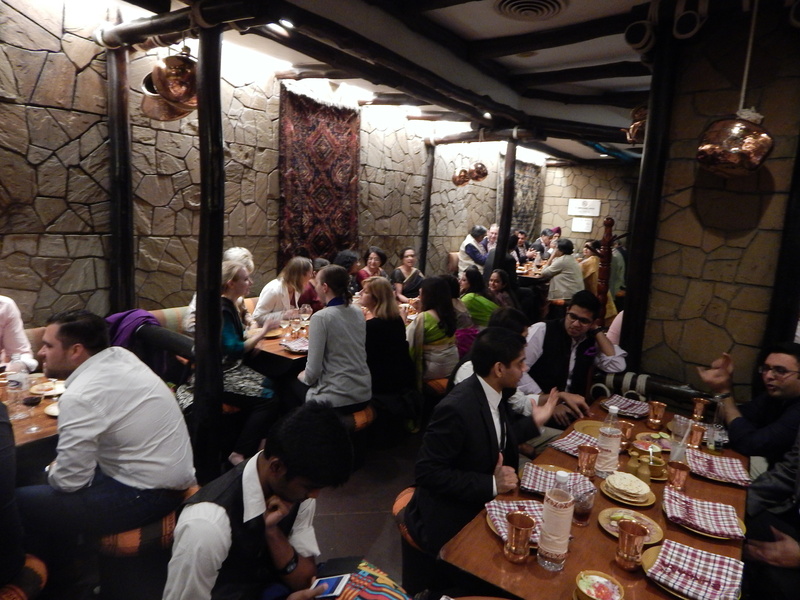 Bukhara – a “frontier”, rustic themed restaurant with the best grilled meat (tandoori) I’ve ever had. I’ll admit I didn’t have the average experience. Our dinner was a wedding reception of around 35 people, so our menu was set. Dish after dish of meat kept rolling out: prawns, lamb, chicken, fish… It was all dowsed in Indian spices, predominately a coriander mixture – my favorite! 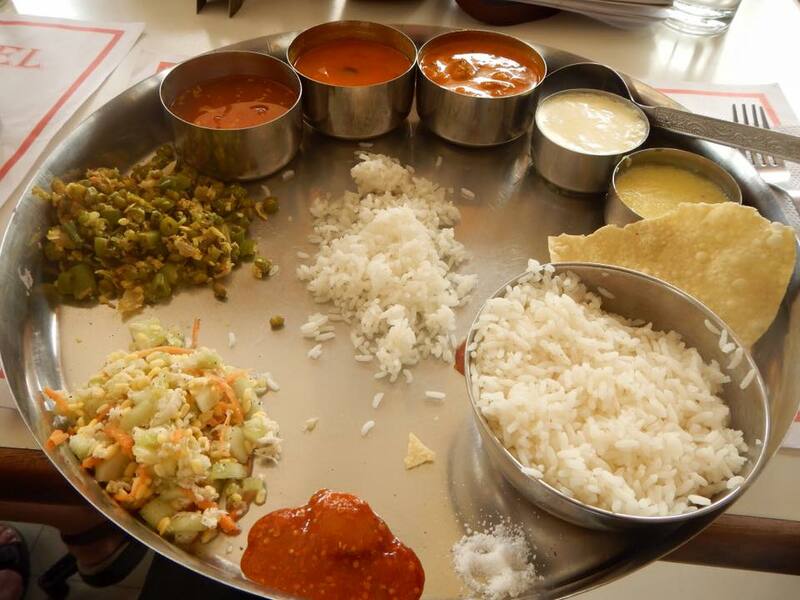 They serve exclusively North Indian cuisine, but that seems to let them perfect the food they feature. The online reviews are over the top and for good reason. You can view the chefs as they cook from behind a class wall (probably to keep the smell of the grill from overwhelming). This is not a cheap date… but if you’re OK with the price, then you’ll thoroughly enjoy it. Trip Advisor has some pictures of the menu, if you’re curious about the price. Note: The restaurant is located inside a hotel. I wrote these tips while we were in the trenches (a.k.a. on the trip), so this advice is pure. These are the things we couldn’t do without. Note: this is specific to a family trip (I had my parents, an aunt, a MIL, a family friend, a sister and Brother-in-law). If you want to backpack and rough it in your early 20s, I’ll write a different post about that (cause I did it in 2006 & 2007). Ya, it’s cheesy, but you won’t know what this means until you get there. 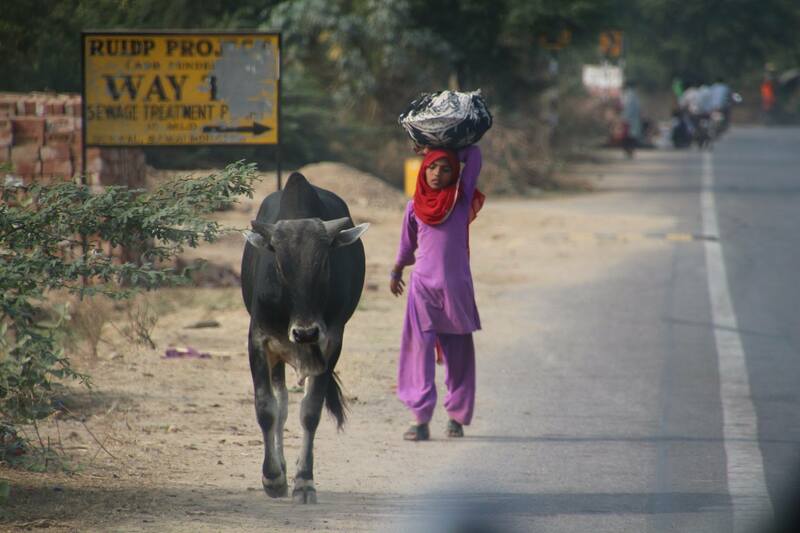 India is the ultimate juxtaposition of the extremes of humanity. Wealth and poverty. Beauty and trash. Ancient and modern. Fast and slow. Frenetic and calm. Lush and dry… I could go on and on. So be ready to get dirty and be ready to get uncomfortable (just wait until I get to the story of our flat tire at midnight in the middle of nowhere), but also be ready to know that you’re in the middle of a perspective-changing, once-in-a-lifetime experience. You’ll be out of your element – rejoice in it. Follow all the general advice you see online: don’t drink anything but bottled water, don’t eat raw vegetables, bring lots of wet wipes and toilet paper, leave your jewelry… Go to a travel clinic and get your malaria and diarrhea medication. Mentally prepare for possibly using a hole in the ground as a toilet (learn how to squat!). We used Thomas Cook to book the first week of our tour. I have to say that we really lucked out with the tour guide they booked. 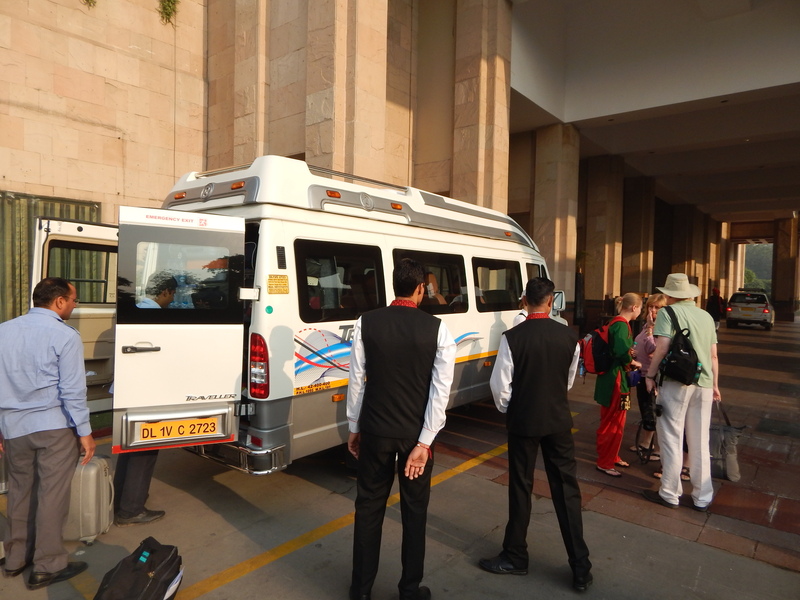 The guide/driver should be experienced, especially if you have no native Indians in your group. We had two hired people with us – an experienced driver who knew English, and an assistant, whose sole job it was to guard the van (and often us) at all times. Later in the trip with a different driver and no assistant, we caught him out of sight of the van and the doors unlocked… when you’re in a foreign country, you can lose trust fast. Peace of mind is priceless. 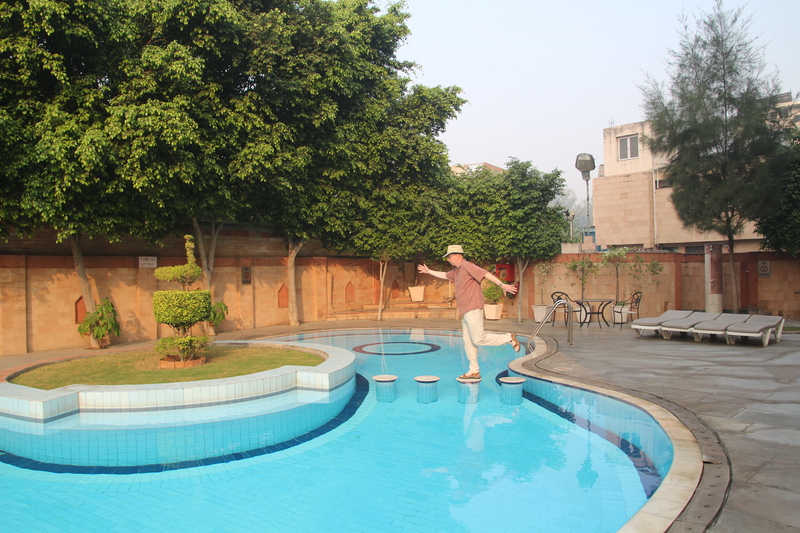 So, if you can, try to book our guide, Sanjay! 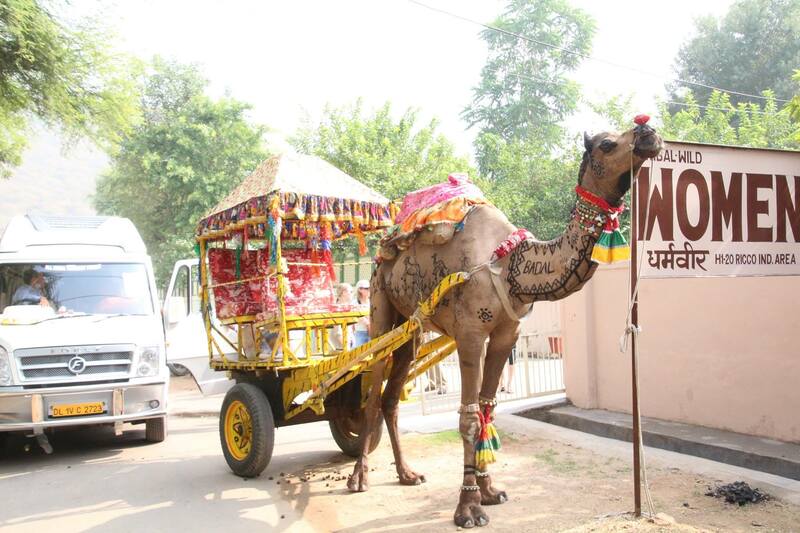 Based in New Delhi, Sanjay is originally from the Jaipur area and very knowledgable of the city. One particular thing we appreciated was that while we were brought to conventional “tourist trap” type stores, he would step inside first and ask them to tone it down. 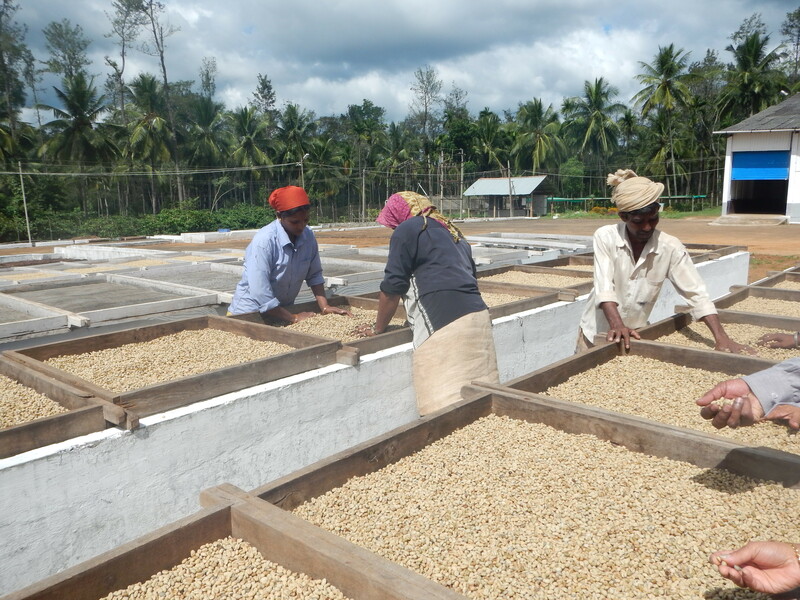 The result was english-speaking store owners who treated us relatively fairly. He would warn us where and when to buy things so that we weren’t ripped off (too much… you can’t change that they know you’re foreigners). Also, he was extremely flexible – if we wanted to change the plan, he would know a different location or restaurant to fit the new plan. For example, we had planned on a trip to Pushkar, but he knew that the weekend we were traveling was a significant religious festival. If we had gone, the crowds would have been bordering on dangerous. We adjusted accordingly. ok… so this isn’t always possible. But my amazing MIL was our life-saver. She spoke up when she thought we were being treated unfairly (just wait until my story at Fatepur Sikri). She haggled, grouping our purchases together and demanding a group discount. When we ended the trip, noone could express the magnitude of their gratitude for her guidance and positive spirit. 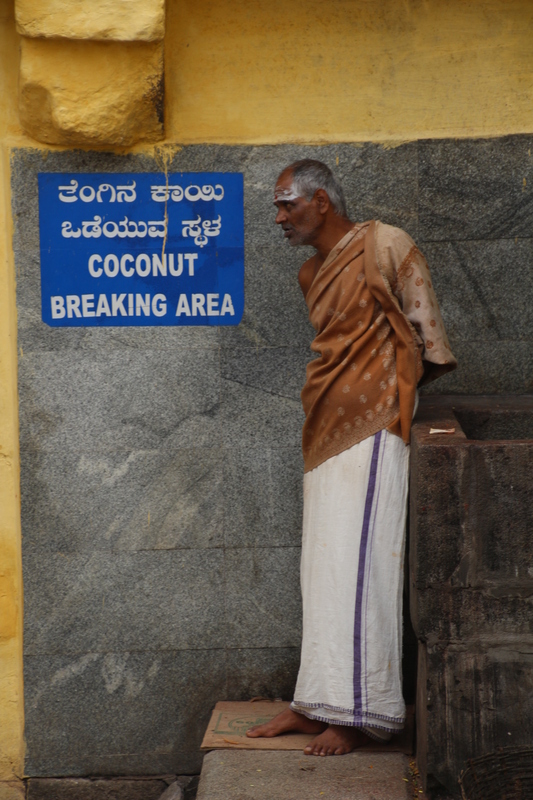 But in more manageable terms – someone knowing even the most basic of Hindi will be an asset. Let your bank know you’re traveling! You’ll be making many cash withdrawals. And never get too low, there’s no guarantee any particular ATM will accept your card to withdraw money. I however had no issue with stores. No joke. With jet lag, you’ll be sleeping in the tour van. You’ll need the sleep and down time, so upgrade to the memory foam! Besides the fact that the chance a bathroom will have soap is iffy, you’ll need to disinfect your hands often if you plan to eat like the locals do: with your hands. Though you are given many passes as a tourist, there’s one custom I suggest you follow: Don’t eat with your left hand. It’s an unspoken “truth” that you use your left hand to wipe, so only your right hand is appropriate for eating. Bargaining/haggling is expected. It will feel very uncomfortable at first, but practice makes perfect. It is more important to know how much something is worth to you, than it is to know what it actually costs. Even after haggling and threatening to walk away, you still may end up paying more than a local would pay. Don’t beat yourself up – as long as you feel comfortable paying it, go for it. But also, don’t be afraid to say no. They’ll be pushier than you can imagine and follow you around the store. 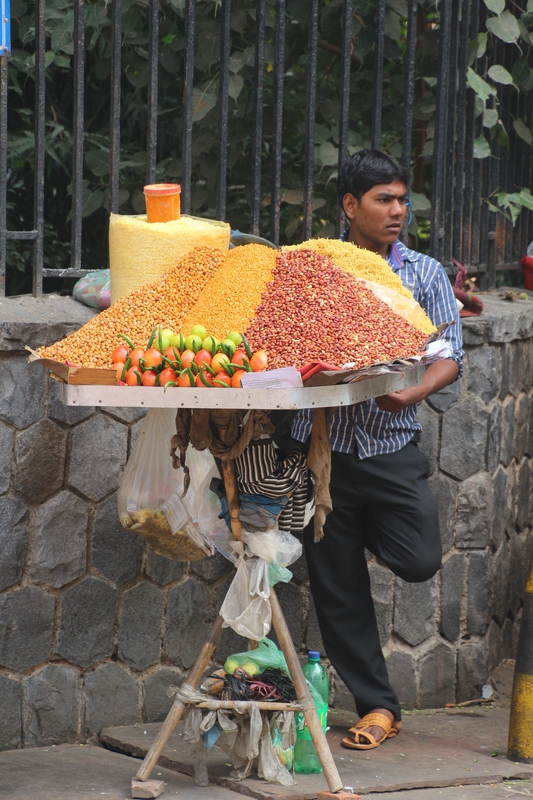 Don’t make eye contact with street vendors or children selling trinkets – they’ll become relentless if you even acknowledge them. A good trick in a larger group is to bargain for the whole group at once. See if you can get a discount for larger volume. If they’re not bringing the price down, grab something and ask for it to be thrown in for free. It’s worked for me!